Stormtroopers are the backbone of the Imperial military, they are the front line in the fight to bring order to the galaxy - often used in both all out war as well as the policing force in occupied systems. In Star Wars: Legion stormtroopers are the Imperials first corps unit option. They are mobile, adaptable, and efficient - and as such see use in the majority of Imperial forces. Stormtroopers are a jack of all trades, but masters of none. They are the workhorse of your list. Their primary job is to make progress towards completing your mission objective. Their secondary job is to engage a variety of enemies in a variety of situations and be ready to fill any role you need to achieve victory. 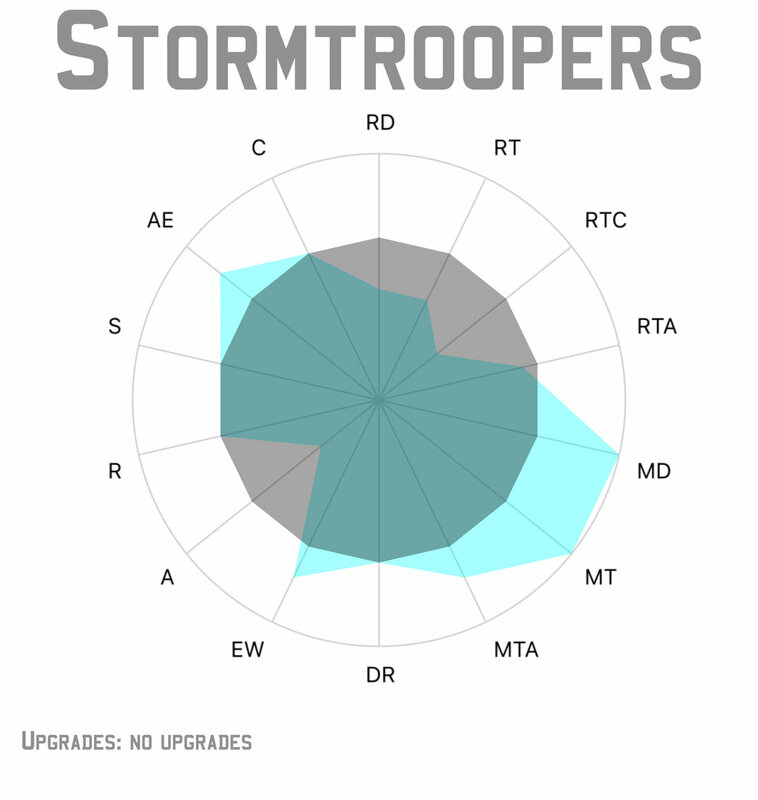 The base unit of Stormtroopers are more or less average in all ways except damage output. However, when you add into account their Precise keyword and an Aim token they become perfectly average (increasing their expected damage output from 1.5 to 2 or 100% efficient). This defines more how you will want to play them on the table rather than how good they are. DLT-19: This is an incredibly versatile gun, and in my opinion one of if not the best gun in the game. Its two red dice increases the Stormtroopers expected output by more than double (from 1.5 to 3.25, adding an incredible 1.75 on its own) and Impact increases the units expected damage against vehicles from 0.5 to 1.6 . It also extends the range that they can engage at from 1-3 to 1-4, allowing the unit to shoot and suppress an enemy at a range that they are unlikely to be able to retaliate from. Also important to note that this weapon excels at splitting fire, with an Aim token a DLT-19 equipped Stormtrooper unit can reliably put 2 wounds into two different trooper units at once. The DLT-19 is a strongly recommended upgrade and you will never regret taking one. HH-12: This is a dedicated anti-armor weapon. Like the DLT-19 it also extends the range a unit can engage from, however it has the Cumbersome keyword so you will have to be in position already before firing. It also exhausts when fired, making this weapon moderately taxing to operate. The HH-12 is also more expensive than the DLT-19 and only adds 1.8 damage compared to the DLT-19's 1.75, however when comparing damage output against vehicles it raises the units expected damage from 0.5 to almost 4. The HH-12 is a situationally recommended upgrade, its valuable when you expect to run into Armor but I would not recommend taking more than one or two. While the base unit of Stormtroopers are somewhat inefficient, when you add a DLT-19 and an extra trooper they become almost perfectly efficient or better in all categories. This changes them from inefficient to average doing the expected work of an 80 point unit for 79 points - because of this I recommend adding a DLT-19 and extra trooper almost every time. I also recommend equipping grenades on Stormtroopers if you can spare the points, depending on if the rest of your list can handle heavy armor or not. Adding grenades raises the cost of an upgraded unit minimally while significantly increasing their damage output at close range. With the addition of wave 3 expansions the Stormtroopers now have access to several new and useful upgrade options. Fragmentation Grenades: These are incredibly strong on your corps troops, just a 4 man unit with grenades increases their damage output from 1.5 to 3.5 making them almost as effective as an 80 point unit for just 49 points, if you increase to the 5th trooper and DLT you are now outputting 6.125 damage at range 1 for a 84 points! this is a strongly recommended upgrade on Stormtroopers if it fits your play style. Recon Intel: for just 2 points this gives your unit scout 2, which is a pretty good benefit. If you have the points to spare you should consider it, but it’s not essential. Officer Upgrade: The Officer Upgrade takes the slot of your generic trooper upgrade and costs 9 points more. For the difference you are gaining an extra point of courage making these units able to play farther from your commander. they also gain Inspire 1 which makes them a great rally point for the rest of your troops to center around. The officer is situationally recommended because of their increased cost. Comms Specialist: The Comms Specialist upgrade takes one of your personnel slots for a reduced price and gives you a comm upgrade spot in return, but you must equip a comm upgrade. The Comm specialist is key in several command card strategies and most of them involve taking a comms relay or an HQ uplink to spread your order tokens or to generate more order tokens. Medic Specialist: Medic Specialist takes a personnel slot and is a non-combatant meaning it can’t add dice to attacks and must be the last unit to be removed before the unit leader. The medic is a useful upgrade to help your attrition advantage, especially when playing with multi wound units or key characters. Stormtroopers want to be deployed keeping in mind that you will want them to be making progress towards the objective(s) - if this is a physical objective like Intercept the Transmissions then this means deploying close to them. Their goal is to get there first and keep the enemy from making progress towards it. The primary way they will do this is by using the DLT-19 to suppress the enemy at a range they can not retaliate from, forcing the enemy to choose between moving towards them or shooting another target. Once the enemies are in range to shoot the Stormtroopers ideally the Stormtroopers will have multiple targets and be able to split fire to further suppress the enemies. When stormtroopers attack with a weapon other than just the DLT-19 they want to have an aim token, whenever possible they want to get this aim token from outside themselves freeing up their second action to move or dodge. Stormtroopers also work best in groups, having pairs of units together increases your suppression efficiency greatly. You can have 2 units split fire against 2 target units and put out 4 suppression instead of 2 all while doing almost the same amount of damage you would have if the units had focus fired on the units individually. Also keep in mind that Stormtroopers only have a courage of 1 and will want a commander nearby at all times so they don’t panic and run from their position. Even though Stormtroopers rely on an Aim token to bring their damage up to average, it is often better to move and shoot twice than to double move one turn and aim and shoot the next. Troopers equipped with an HH-12 want to be deployed in a position where they can quickly and easily engage enemy armor. Once in range aim and shoot or recover and shoot until the armor is dealt with. If the enemy doesn't have armor or you have already dealt with it then these units of troopers become much less effective and are better spent moving and trying to make progress towards the objective - ideally the less contested objective if there is one. When playing against Stormtroopers it is important to remember that they rely on an Aim token to get their damage output up to average. Because of this they will tend to be a bit stationary and predictable. If the unit of Stormtroopers outrange you with their DLT-19 it is best to use Line-of-Sight blocking terrain to cover your advance into a range you can attack them from. If there is insufficient LoS blocking terrain you can use then wait until after they have activated to make your advance into range. Once you are in range to attack you will want to activate before them and suppress them before they can activate; denying them their aim token and significantly lowering their expected output and efficiency.